November, 12, 2009, HUNTINGTON. 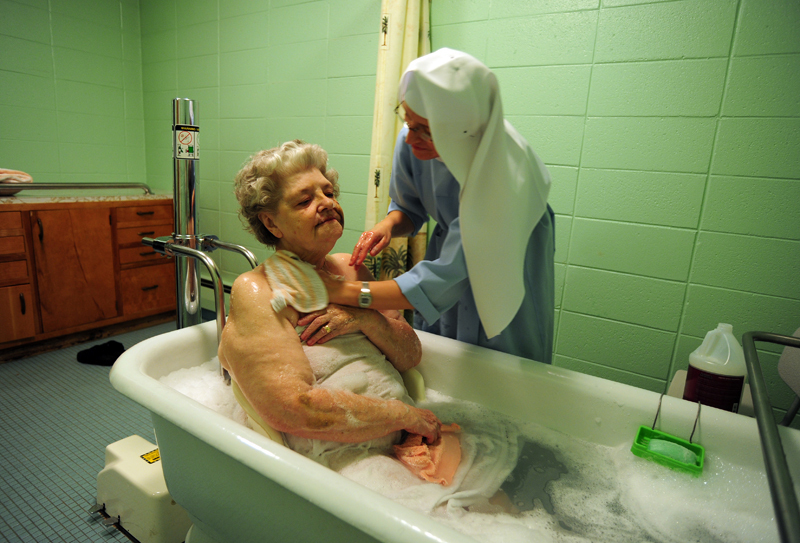 Sister Luiza bathes Ann Christ who has a heart condition and needs assistance. They bathe once a week or as needed, the nuns assist for protection and safety. Newsday photo by Mahala Gaylord. The Missionary Sisters of St Benedict are the only traditional convent on Long Island. I had the pleasure of spending the day with the sisters and their wards for a Newsday assignment and I have plans to return for a more long term project. The Newsday article was a profile on the convent as part of the papers coverage of the Vatican's investigation of American Nuns. I am more interested in the relationship between these nuns and the elderly they care for. The nuns have what you might call a motto that came from St. Benedict: 'work and prayer.' The prayer part is pretty obvious, but work for these nuns is about taking care of the elderly. The convent runs what might be compared to a nursing home called St. Joseph's Guest Home. The 43 elderly residents are completely cared for by the nuns and even the most intimate of tasks like bathing, as above, are done with care, affection and dignity. I would like to explore the family that exists between these nuns and the residents of St Josephs. For the Newday article click here.